SHANGHAI: China's central government has officially approved the Shanghai Disneyland Project, the Shanghai municipal government announced Wednesday. However, it will take another five years for the park's first phase of construction to be completed, according to a spokesman for the Pudong New District government. An official involved in the project talks said the park's planned area was estimated at 7 square km. The project is expected to cost 25 billion yuan ($3.66 billion). Officials with the foreign investment department in the district government said several big state-owned firms in Shanghai would form a joint venture with the Walt Disney Co. to invest in the project. The government's information office said Wednesday that talks had started on details of the project. Disney president and CEO Robert Iger said in a statement that China was one of the most dynamic, exciting and important countries in the world, and the approval marked "a very significant milestone" for the Walt Disney Company in China's mainland. The California-based company had its theme park business affected by the economic downturn. It reported a 19 percent year-on-year fall in profits from its parks and resorts for the fiscal third quarter in July. Secretary for Commerce and Economic Development of the Hong Kong Special Administrative Region (HKSAR) government Rita Lau said Wednesday that the planned Shanghai Disneyland theme park and the existing Hong Kong Disneyland would complement each other. She said the Chinese economy was growing fast and the Chinese market, with its huge potential, would be big enough to sustain two Disneyland theme parks. Margaret Fong, commissioner for tourism with the (HKSAR) government, said the Hong Kong park attracted visitors from not only mainland but also southeast Asia and other places. Hong Kong business people have said the number of tourists from the mainland would fall as Disneyland visitors would be drawn to the Shanghai park, but the Hong Kong park, with some unique attractions, should remain an attraction. "I am looking forward to the amusement park in Shanghai," said a 23-year-old Beijing resident who gave her surname as Wang. "I visited the Hong Kong Disneyland this year. English was commonly used in the park, which may have brought language barriers for tourists from the Chinese mainland. It would be more home-like to visit the Shanghai Disneyland," she added. The green light for the park comes less than two weeks before US President Barack Obama makes his first official visit to China. "It's a perfect time for China to announce the approval, if it's going to be approved anyway," Xin Qiang, vice director of Shanghai-based American Studies Center of Fudan University. The project is expected to bring huge benefits to both sides. 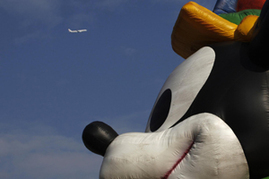 But experts said the Disneyland in China should absorb Chinese culture to win lasting favor of local visitors. "It's like the diference between a tea house and a coffee bar. Chinese people may visit the Disneyland once or twice for new experiences, but I don't think they will keep visiting a pure American theme park that has nothing to do with their own culture, " said Sun Zhe, director of the Beijing-based Sino-US Relations Research Center of Tsinghua University. "If Disney wants to keep booming business in China, innovation and localization is a must," Sun said. Land property around the planned site of the park saw a drastic increase in price at the news. One and half hours after the announcement, a piece of land with an area of 56,500 square meters in the vicinity of the site was auctioned off at 1.19 billion yuan, 264 percent of its premium. "I am very glad that the project was approved," said a local resident surnamed Cai, 60, who would probably be relocated after the construction starts. "One the one hand, I can bring my grandson to visit the park. On the other hand, I am expecting a handsome removal compensation since my house would be torn down for the park," he added.